There are 28 known species of Rabbit Fish, the one pictured directly above is a Siganus Doliatus. The top picture is a One Spot Foxfish. 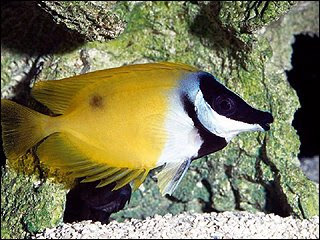 They are mainly found on the Pacific and Indian Oceans. These Rabbit fish average 10-12". Some are edible, but with sharp spines on fines it's really not worth it. Make sure to handle these type of fish with extreme care. 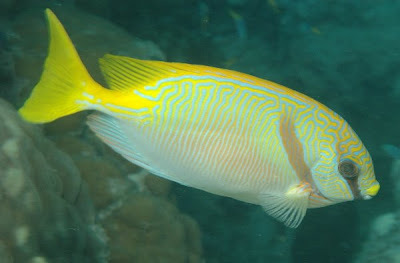 The Rabbit Fish is popular in aquarium setting due to their bright color and their ability to consume a large amount of algae which keeps tanks cleaner, longer.